Gimme that horse marriage DLC. 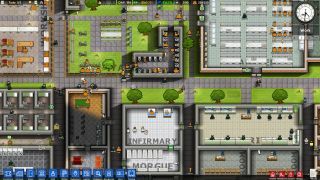 Prolific strategy publisher Paradox Interactive has purchased all the rights and assets for the Prison Architect IP from Introversion Software. Beyond giving Paradox ownership over a three-year-old game—which it also already publishes on iOS and Android—it lets the publisher turn it into a series under the 'Architect' umbrella. One notable difference between Prison Architect and the rest of Paradox’s contemporary catalogue is the absence of DLC. Paradox Development Studio’s games typically receive the most, with Crusader Kings 2 boasting 15 expansions and more DLC beyond that. Cities: Skylines has more in common with Prison Architect and launched around the same time, and it has seven expansions and various smaller content packs. While lots of post-launch extras are par for the course with Paradox, the fact that Prison Architect has already been out since 2015 and has been updated several times since then means it might be left alone, with Paradox instead looking to develop new Architect games straight away. Though judging by CEO Ebba Ljungerud’s statement, it might be a bit of both. Paradox hasn’t announced any developers yet, or if future games will be developed in-house. My pitch: Dynasty Architect—basically Crusader Kings 2 but you also have to manage a castle. Dig a moat, plan feasts, assassinate your spouse. Paradox’s dynastic sim is probably coming to an end soon, so let’s get the CK2 team on this straight away. As for Introversion, co-founder Mark Morris promised more details on their upcoming projects soon. Last time we checked in, it was early days for possible colony sim Order of Magnitude, and we’ve seen nothing since. Indeed, it’s still not even on Introversion’s official site.